We’ve reached a point in our everyday lives when we simply don’t go out of our homes without having a pair of earbuds or headphones. Whether it’s for listening to music, podcasts, or isolating ourselves from outside noise, a good pair of earbuds has become a necessary part of our everyday carry. If you wear earbuds for the latter reason, noise-cancelling ones are a great option to consider. However, with a wide range of different noise-reducing technologies, models, sizes, and features, finding the adequate ones can be pretty tough. That’s exactly why we’ve decided to round up the most important specs the best pair of noise-cancelling earbuds should have, as well as present you with our pick of the 10 best ones on the market. Now let’s see exactly what each model has to offer. Bose is known as the first company to introduce the concept of noise cancelling headphones to the public. The QC20s offer high levels of active noise cancellation, while still being very comfortable and pleasant to use for longer periods of time. The ANC technology that Bose implemented works like a charm. You practically feel as if someone just put the whole world around you on mute. Street traffic, chatter, and loud wildlife sounds simply fade out when you turn on the ANC feature. As this can be a bit dangerous, not being aware of your surroundings when in traffic, for example, there is a special button which activates the “Aware mode”. This lets some of the surrounding noise in the mix allowing you to hear people and cars around you. The QC20s feel pretty durable, both the silicone tips and the cable seem solid. There are also clip-on wings which keep the earbuds locked in place so they don’t accidentally fall out of your ears. Sound quality is solid. 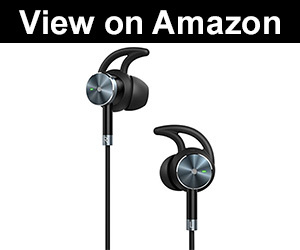 They aren’t bass heavy as most earbuds tend to be but still have an emphasis on the low end. These Bose noise cancelling earbuds perform amazingly well, both in terms of sound quality and noise cancelling. The overall design and ergonomics make using the QC20 a very pleasant experience. Just be careful as there are different models for iOS and Android devices! An upgraded and wireless brother of the QC20, the QC30 takes one more step in improving the already rock solid Bose design. Following the steps of the previously mentioned model, the QC30s feature the same sleek design. The ear tips fit nicely, adding a neat layer of passive isolation. The neckband design can be a dealbreaker for some, but we found that it is very comfortable and doesn’t get in the way. As the neckband also houses the microphones for the noise-cancelling system as well as the Bluetooth components, it eliminates the bulkiness. A small control center is located on the right earbud cord, which houses a call microphone, as well as volume controls. Bose decided to ditch the “Aware mode” and give the user full control of the levels of noise-cancelling via the mobile app. This means that you can easily fine tune and adjust the amount of surrounding audio you want to hear. The signal processing this model uses is the same one used in the QC20, making these ones of the best wireless noise-cancelling earbuds you can get. The QC30s are by far the best Bose earbuds if noise cancelling is what you’re looking for. The added wireless feature makes this model a nice step up from the already nearly perfect QC20s. Though not that famous of a company, Phiaton managed to show with their BT220NC model that they also know how to make a pair of good and affordable noise cancelling headphones. These earbuds are made of plastic and are pretty lightweight. If you plan on using them while working out, or in the rain, be careful as they aren’t sweat or water resistant. Even after a couple hours, the BT220NC feel super comfortable. There are of course differently sized ear tips, so finding the right ones for a snug fit shouldn’t be a problem. The ANC circuitry is packed in a small box located on the cord. There are also music control buttons, the Bluetooth components, as well as a button for toggling the ANC feature. These noise-cancelling in-ear headphones block pretty much all of the outside audio. When compared to the Bose QC20s, they perform at a level slightly beneath that model. Battery life is great, with around 16 hours of use time, depending on how much you actually use the ANC feature. These buds are wireless as well and are a good competitor to the QC30s. If you’re looking for a pair of top noise-cancelling earbuds that are wireless, and don’t cost as much as the QC30s do, definitely consider these ones. With all the mentioned pros, the under $100 price tag makes them one of the best affordable noise cancelling headphones. 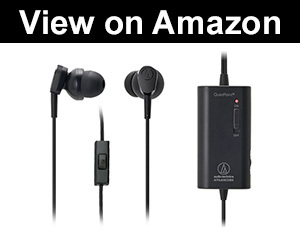 The Audio- Technica ATH-ANC23s are one of the best selling noise cancelling earphones on the market. Let’s see what exactly makes them that special. 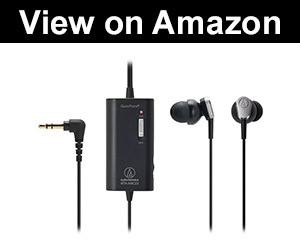 As you would expect from Audio-Technica, the build quality of these earbuds is high. Though they are plastic, they can take a beating and are pretty durable. Comfort is an important factor, so the ATH-ANC23s feature a lightweight design in order to make you feel like there is nothing inside your ears. The amount of noise that these cancel out is simply amazing, making them one of the best noise blocking earbuds. The ANC system lets you hear people near you, but just enough so you can be present and enjoy your music at the same time. If you thought that 16 hours of battery life was amazing, the 60 hours this model provides is absolutely stunning. Another great feature Audio- Technica included is the possibility of replacing the dead battery with a new, fully charged one. For around $50 it probably doesn’t get better than these bad boys. 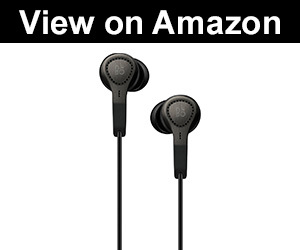 Not only does the ANC feature do a great job, but the sound you get from these earbuds is better than most other competitor models have to offer, especially at this price point. 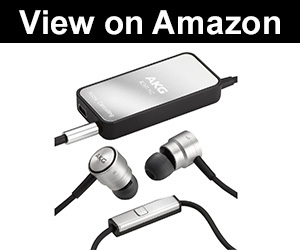 AKG has been praised as one of the top companies in the world of audio equipment. But how do the K391NCs perform as their noise cancelling earbuds candidate? Both the earbuds and ANC/ battery box are made out of aluminium, giving the K391NCs a very durable and lightweight design. The cable is rubberized and pretty thick, so you can most definitely say that these are probably the most solid feeling noise cancelling earphones out there. As far as the noise cancellation goes, most background hums and white noise are blocked easily. However, not all high pitch noises get filtered out. Overall, they perform pretty nicely. The box also has a mic for answering calls, with the sound quality being mediocre but good enough for everyday use. Battery life lands in the middle of the previously mentioned models, with around 35 hours of use. When it comes to audio quality, the frequency response is more of a flat one, without the bass and treble accent the Bose ones tend to have. 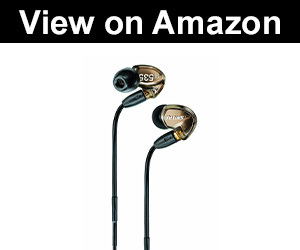 If you’re a fan of near- flat frequency response, definitely give these ones a shot. If you’re looking for a good pair of sound cancelling earbuds that offer solid noise isolation, a flat frequency response, and won’t die on you after just a couple of months, the AKG K391NC are a good choice. No audio tech review would be complete without at least one Sennheiser product. Let’s see what they have to offer when it comes to the best sound cancelling earbuds. The CXC700 feature a sleek and nice looking design. They fit nicely and provide good passive noise isolation as well. Sennheiser products are known to last very long if you take good care of them. Durability is solid, nothing too much, so keep that in mind and fold them up nicely once you’ve finished using them! What makes these buds special are the 3 different ANC modes you can cycle through. Mode 1 and 2 are perfect for short or long subway/ airplane trips, or rooms with loud AC. Both of these modes offer -23dB of cancellation. Mode 3 is useful when you’re on the streets or the office, as the -15dB still lets you hear other people without having to take the buds off. Sennheiser also included a TalkThrough function which totally mutes the audio so you can hear your surroundings. Battery life is decent, around 16 hours, and sound quality is above average, standard for most Sennheiser earphones. If you value audio quality as much as noise cancellation, the Sennheiser CXC700s are your best bet. 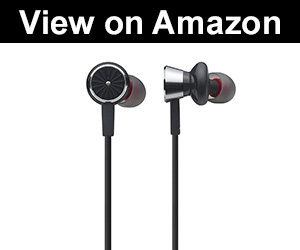 For around $200, they are the best in ear noise cancelling earbuds in that price range. Shure is a company famous for their high- end audio products. 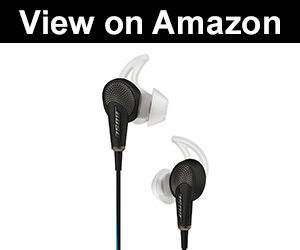 Let’s see what makest their SE535-Vs one of the best in ear noise cancelling headphones. If having an amazing audio experience besides the standard noise-cancelling option, Shure has got you covered. These soundproof earbuds feature an amazing build. Unlike most other earphones, these have a tweeter and to miniature woofers inside them, so you can just imagine the sound they produce. Besides the more complex build, they are still very lightweight and comfortable to use. Do note that unlike other models we’ve mentioned, these offer passive noise isolation, without any microphone and counter- wave systems. The sound isolating sleeves come in multiple sizes and provide up to 37dB of isolation. The Shure SE535-Vs are expensive. But then again, for around $450 you’ll be getting a pair of premium sounding noise reducing earbuds which are very comfortable and amazingly durable. If you’re an audiophile and like to listen to music in peace and quiet, go for these. TaoTronics is one of those companies that can’t say they are well known around the world, but still, have a lot to offer. The TT-EP01 in-ear noise cancelling earbuds are a clear example of just that. 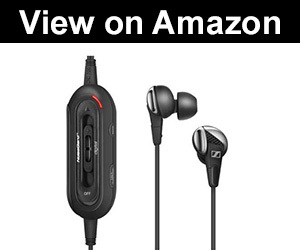 When it comes to the build quality, we were pleasantly surprised with the sturdiness of these earphones. They are made of aluminum and feel lightweight and pretty solid at the same time. A gold- plated 3.5mm audio jack adds to the rich and clear sound. They feel like they have a slight bass boost in the overall mix, but nothing an EQ on your device can fix if you don’t like it. 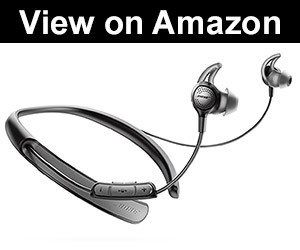 The active noise-canceling is easily controlled via buttons placed on a box integrated on the cable. It manages sounds up to 30dB, not quite as much like other models we’ve mentioned, but it does a solid job. There are also integrated song skipping/ volume controls on a separate box so you don’t have to reach for your phone all the time. All in all, these sound cancelling earbuds perform nicely, especially when you consider the less than $50 price tag. They just may be the best cheap noise-cancelling earbuds. Bang & Olufsen audio equipment is famous for being of high quality but at the same time very expensive. The Beoplay H3 however, although around $200 offer a great option if you’re looking for a pair of the best noise cancelling earbuds which are well designed and feature amazing audio. The build quality of these earbuds is up to expectations, and they feel sturdy enough to last you a good couple of years. A minimalistic stainless steel design rounds these bad boys up very nicely. The ANC system is integrated inside a neat round box, which includes a charging port, the ANC controls, as well as a call microphone. We found that the noise cancellation works great, whether it’s people talking, airplane sounds, or just basic urban noise, the Beoplay H3s perform nicely. When it comes to sound quality, B&O offers only the premium audio experience, which is the case with these active noise cancelling earbuds as well. As a part of B&O’s less expensive line, the Beoplay H3 ANCs are one of the best noise cancelling earphones you can get if you are a fan of a more flat yet crisp audio response. And finally, at number 10, we have one more model from Audio-Technica. The ATH-ANC33iS are slightly more expensive than the previously mentioned ANC23 model, but still land in the price range of around $50. Let’s see how they perform. Though plastic was the material of choice, these noise cancelling headphones with microphone attached feel pretty solid. Be careful with your choice of box placement though, as it can bend the cable and cause it to break sooner than intended. The ANC performs quite nicely and manages to filter out even that pesky wind noise. Although not that effective like the one Bose uses, it’s still very good nonetheless. The main differences between this model and the one we mentioned already in this article are a longer cable, an integrated microphone for calls, and slightly larger audio drivers. It may seem that these are minor upgrades, but they round these noise blocking earbuds quite nicely. All things said, the new and improved ATH-ANC33iS is a great budget choice when it comes to the best noise cancelling earbuds. It’s probably your best option if you’re just getting into this kind of headphones. The advantages of earbuds over headphones from an every day carry perspective are pretty obvious. Over-Ear Headphones are much bulkier, robust, and take up more space. Earbuds on the other hand, besides being much more practical, and overall taking up way less space, also provide the user with some passive noise cancelling as well. Sure, over-ear headphones cup the whole ear and muffle the outside noise, but earbuds plug the ear canal in a way that most of the outside sound remains more or less muted. That’s why, at least in our opinion, when it comes to noise cancellation, earbuds are a more practical and better working solution. As we’ve just mentioned, earbuds offer a layer of passive noise cancelling. This is achieved easily by finding a pair of good earbuds that fit your ears nicely. Just by having a tight fit, you won’t be hearing most of the outside noise. However, this may not be enough in some cases. That’s where active noise cancelling comes in place. The technology behind this feature is pretty simple. A microphone located on the headphones listens and records the outside audio, and gets processed by special circuitry. A counter- signal is then generated and gets sent to the earbuds, which counters the surrounding audio. This way, no matter what kind of noise you may find yourself surrounded with, you can enjoy your music peacefully. Some people even like to use this kind of earbuds in order to enjoy silence, without any music. Wireless headphones offer that extra mobility, and not having to deal with tangled cables can save you a lot of nerves. The usual downside of wireless earbuds and headphones is that they need to be charged. In this case, as active noise cancelling earbuds need to be charged anyhow, in order for them to actively listen and block out noise, it’s up to your personal preferences. As we’ve just mentioned, active noise cancelling requires some extra juice in order to work. Having that in mind, battery life becomes an important factor when choosing the best ones. If you plan on using your earphones when travelling, or any other occasion where you won’t be able to charge them, choose wisely, as different models offer varying battery life. This is a feature commonly found on most active noise cancelling earbuds. A small pad on the cable allows you to control the music, switch the ANC on and off, and even has a mic for taking calls. If you’re that person that can’t just press play and relax, or someone that’s receiving phone calls the entire day, this feature is a must have. How much are you ready to spend? As with most tech items, the price range is huge. We tried to include the cheaper models, as well as some mid- tier and more expensive ones as well. The more you pay, the better the sound quality and noise cancelling get. However, this doesn’t mean that the cheaper alternatives don’t do the job. As you’ve had the chance to see, there are really loads of different options when it comes to the best sound cancelling buds out there. That’s why we’ve decided to simplify things a bit. If you’re looking for noise cancelling headphones with microphone, the ATH-ANC33iS by Audio-Technica, are a good choice, as well as Bose QC20/30, depending on the rest of the specs you find important. If budget is a major factor, the best cheap noise cancelling headphones we would point out are the TaoTronics TT-EP01, as a model that features a solid build and nice ergonomics. However, as the best noise cancelling earbuds under $100, the Phiaton BT220NC take the cake, especially as they are wireless and offer both solid ANC features as well as good audio. On the other hand, choosing the best noise cancelling headphones under $200 wasn’t that easy. After considering all the factors, we would have to go with the AKG K391NC, primarily because of their outstanding durability and performance. There you have it folks, we hope that we’ve helped you in your quest of finding the best noise cancelling earbuds for your needs. Thank you for reading and see you next time!